at distance of 80 miles. 12 P.M. 3 bars of slaty blue on horizon over the sun, gold and yellow and red above and beneath the yel[low] back of the slate bars. Upper red bars dimpled and furred on edges. Red becoming duller, fading into purple around the edge of horizon and that into blackish blue 90o in either direction. Beautiful yel[low] green between the bars on back of all colors. June 19. Sunshine today, sunshine from morning till night after a month of cloudy gloom! A more delightful day of light I never enjoyed. After sighting the Aleutian Islands all the way through Behring Sea and along the Siberian Coast in the Arctic Ocean it snowed every day and was cloudy all day, more or less dark. The sun would appear at times through the dun slate or sooty clouds, but always with some film of clouds over it, never perfectly clear. One bland day in the Arctic, calm water, brooding stillness, but a dusting of snow before night. Temp. at 42. Today 65, and a bee and birds and flowers. No ice in sight, no snow save afar on the mountains. There has been a strange depressing effect from so constant a darkness, as if one had been in a cavern rather than under cloud. How depressing not fully appreciated until the amount of reaction caused by the full, genial, divine light unclouded. There [are] (is) only a few fluffy tufts [of cloud] and how blue the sky, the deepest I remember having seen. Original journal dimensions: 11.5 x 21 cm. To view additional images from the "June-October 1881, Cruise of the Corwin, Part II" journal, click here to view the image gallery. 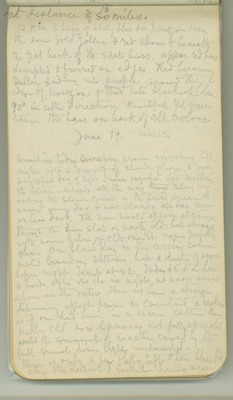 To view additional journals by John Muir, click here to view the top level of the collection.